I haven’t had much time with my new Insta360 Air, but by special request, here are a couple of sample photos and a sample video. Please note I was using only the prerelease version of the Insta360 Air app. When the app is released, it will have improvements. The photos and videos were shared via Twitter. When you do that from the app, they are uploaded to Insta360’s servers and then a Tweet is created for you (you just have to press “Tweet”). To share them on this page, I went to the Insta360 sharing pages and used the embed code from there. There are other sharing options from the app such as Facebook and YouTube, but this is the option I chose this time around. This sample shows some purple fringing near the door, but my understanding is that the release version of the app will include purple fringing correction. The video appears to be only 720p. I don’t know if that’s because I was uploading from a mobile connection, or because of a sharing limit on Insta360 servers. I’ll post it again on YouTube when I get home. Not bad. The stitching is very good. There are some color/saturation differences between the lenses, but very good overall The video is stitched very well too. A good price level for the ability to live stream as well. Hi Rich. Yes I agree the stitching is pretty good on both photos and videos. About the color / saturation differences, I think they are minor, and they might be fixed in the actual app (not the prerelease app). 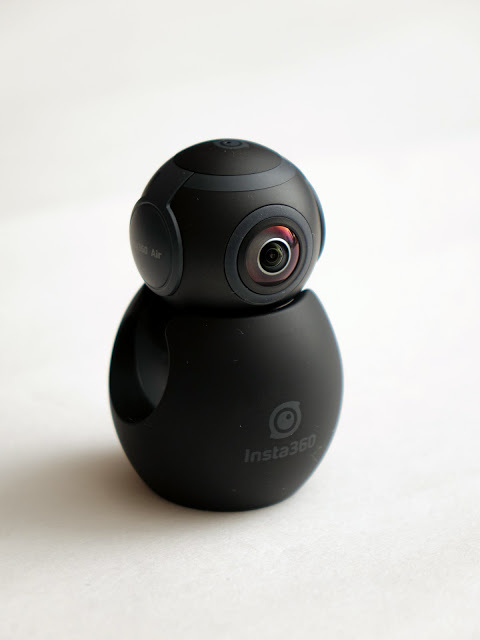 So far I think the Air is a good buy for any Android phone user, either as their sole 360 camera or as a secondary 360 camera for casual use, livestreaming and social media. Let us know when you get time for the livestreaming! Hi Martin! With the pre-release app, it is not yet possible to livestream. Similarly, Periscope 360 for Android is not yet available But when the release version of the Air app becomes available, I believe it will have livestreaming (based on the samples shown at CES) and I will definitely try it!